The Smithfield Sun is no longer publishing new stories. This archive will be kept online for as long as possible. All original photographs can be downloaded from their individual photo pages. We encourage you to save your favorites. We’ve loved being part of your wonderful town. Thank you for everything. Cache Valley Lions members gathered on April 9 in the cozy Smithfield Lions lodge along with District Governor over the Northern Utah Lions, Bonnie Johnson, and other officials from the Lions board members. At this annual gathering awards were given and accomplishments celebrated. The Lions club concentrates on service, which was apparent in the awards. The stage of Sky View’s auditorium was alive with “The Sound of Music” from March 27th to April 5th as the Four Seasons Theater Company performed eight different performances of the Rodgers and Hammerstein classic. Four Seasons Theater Company has been busy rehearsing for this year’s musical theater production “The Sound of Music” that will be presented over the next couple of weekends. SMITHFIELD—Teacher at the longest running home preschool in town, City Council member, and mother of six, Barbara Kent has been active in the community for more than 30 years. The Smithfield City Council meets Wednesday evening to consider a report on the library construction project, bid for Birch Creek well pump, approving Loren Mortenson to tree committee. 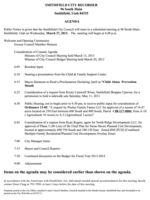 The meeting begins at 6 PM at city hall (96 S Main St, Smithfield, Utah). SMITHFIELD—Green fields for baseball and softball, an equestrian park and outdoor batting cages are just a few features that Forrester Acres Park, home of the 120-year-old Smithfield Blue Sox, offers the community. 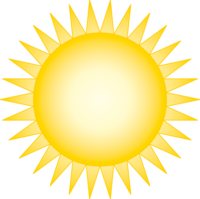 Patricia C. Forsgren Posted March 7, 2014 3:00pm Sky View Encore! Celebrate good times, come on! Sky View High School’s Encore Performing Group proudly presents their spring show—Celebrate! Come and enjoy song and dance numbers from all of your favorite eras including classic favorites like ‘Joint is Jumpin,’ ‘Love is Here to Stay,’ ‘Route 66,’ and ‘Rock and Roll is Here to Stay,’ as well as contemporary hits including ‘Skyfall,’ ‘Forget You,’ and ’You’ll Be in My Heart.’ Fun for the whole family! SMITHFIELD—The town’s 93-year-old Carnegie Library on Main Street is getting a $1.44 million two-story, 5,600-square-foot expansion. The Smithfield City Council meets Wednesday evening in their regular meeting to consider: carnival rides at Health Days, retrofitting lighting at city buildings, disbanding HOA for Three Creeks Subdivision, public hearing for mid-cycle budget amendment, selecting Mayor Pro Tempore. 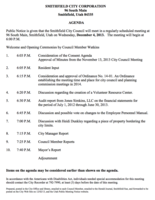 The Smithfield City Council meets tonight to consider: creating a Volunteer Resource Center, discussion with Heidi Dunkley about property bordering the city limits, next year’s city council meeting schedule, audit reports, possible changes to the employee personnel manual. Some of Cache Valley’s elite athletes are preparing hard for this year’s “Winter Wonderland” figure skating show. 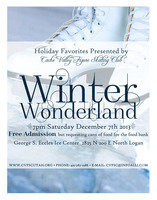 Please join the Cache Valley Figure Skating Club celebrating the season with holiday favorites. Performance is at the Eccles Ice Center (2825 N 200 E, North Logan, Utah) on December 7, 2013 at 7 PM. Admission is free, but canned goods for the food pantry appreciated. For more information call the Ice Center at 435-787-2288. Sky View’s Sky High Players wrapped up the four night production of their annual variety show on Monday night. After a decisive home victory against the Highland Rams in round one of the 4A State Playoffs, Timpview proved to be too much for Sky View to handle in round two on Friday. Last week the Bobcats put another win in the books with a defeat of the Highland Rams. The win came in the first round of the 4A State Football Playoffs. They pack up their pads and take their 9-2 record south to take on Timpview in a second round playoff game this afternoon. Unofficial results from November 5th election: Darrell Simmons re-elected as mayor. Barbara Kent and Kris Monson were re-elected to the city council. Would you or someone you know use the Smithfield Library more if we could access it more easily, that is push a stroller in or park off street and walk right in with several kids any time of year? Tonight at 6 PM a very important Public Hearing is being held in the City offices (96 South Main) to approve the Library project funding. There is a public hearing over the proposed bonds to expand the Smithfield library. The hearing is part of the regular Smithfield City Council meeting that begins at 6 PM at city hall (96 S Main, Smithfield, Utah). 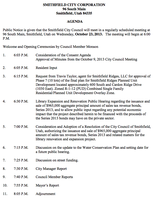 Also on the agenda for consideration: approval for phase 7 of the Smithfield Ridges Planned Unit Development, discussion of the water conservation plan, discussion on street funding. After a disappointing loss to region foe and valley rival Logan, Sky View recorded a pair of key region wins. The Bobcats won a hard fought battle two weeks ago against the Box Elder Bees with a 28-23 victory in a Thursday night game. They followed that up this week with a pre-UEA weekend drubbing of the Ogden High Tigers by posting a 52-0 Wednesday night win. The Sky View Bobcats split a pair of valley rival games beating Mountain Crest 49-16 two weeks ago, but found themselves over matched in a 52-21 Thursday night loss at Logan. SMITHFIELD — After an unsuccessful attempt to get a kennel permit from either the Planning and Zoning Commission or the City Council, Chris Biggs says he is being treated unjustly and will appeal to civil court. However, his neighbors say the reason his permit keeps getting denied is because Biggs doesn’t have the ability or the willpower to maintain the dogs that already live with him. 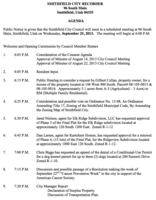 SMITHFIELD — The City Council met Wednesday for several public hearings, most of which had been discussed at the Planning and Zoning Commission the week before. Resident Chris Biggs requested a permit for a dog kennel at his home so he could own up to three dogs. The permit had previously been denied by planning and zoning commission. A Founders Day Celebration will be held on October 10, 2013 at 7:00 P.M. at the Senior Citizens Center on Canyon Road. Featured Speaker will be DeLoy Hansen, former resident of Smithfield and owner of the RSL Soccer org. Four Sr. Citizens will be honored and they will tell of some of their early memories of Smithfield. The Smithfield City Council will meet Wednesday to consider amending the city zoning map, change property zoning near 106 West 400 South to multi-family, final plat approval for two subdivisions, appeal rejection of a dog kennel at 200 Summit Drive. Homecoming week is always sweeter with a victory on the football field. The gridiron action did not disappoint on Friday night as the Bobcats struck first and put up a 59-14 victory over the Provo Bulldogs. It’s homecoming week at Sky View and the week has been full of activities including an assembly, a water party, the parade, Mr. Sky View Pageant and much more. The SV and MC Marching bands will be performing their 2013 shows at the Marching Band Family Night — Monday at 7:30 PM. The Sky View show is titled “Rhythm of the Rain Forest.” The Mountain Crest show is titled “Immortals.” The community is invited to attend this event to help friends and families of these talented and hardworking students kick off their competitive seasons. 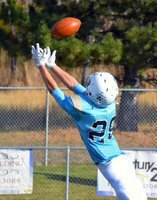 The Sky View Bobcat football team moved to 2-1 on the season after a dominating win over the Minico Spartans of Rupert, Idaho. Barbara Kent (incumbent), Kris Monson (incumbent), Kathryn Larsen and Jeffry Gittins will vie for two council seats in November’s election. Curtis Wall, Dwight Peterson and Joshua Peterson did not advance in yesterday’s primary. Kelly Cannon at the Herald Journal wrote a great article about the seven candidates vying for two seats on the Smithfield City Council. With the primary election less than two weeks away, it’s a great overview and a worthwhile read. 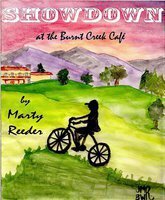 After a successful novel-writing experience last summer, Smithfield resident Marty Reeder is looking to repeat this year by writing a proposed young adult novel titled Showdown at the Burnt Creek Café, releasing it one chapter per week in e-reader formats starting this fall. This coming Tuesday, May 14, at 5 PM, a new Smithfield City park will be born! Volunteers, guests, and city officials will gather at Sunset Park, located at the corner of 600 S. 1000 E. to plant 25 trees. TreeUtah, donors, and the city have joined forces to fund the tree purchases and get our latest arrival off to a good start. 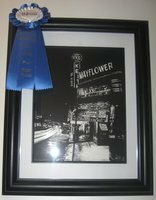 Logan, Utah — The Logan campus of Stevens-Henager College, a leading provider of on-campus and online higher education, recognized 18 local high school students at its 7th Annual High School Art Show. SMITHFIELD – Between city proclamations, requests concerning land from residents and discussion of fire engines, Mayor Darrell Simmons kept busy during Wednesday’s City Council meeting. SMITHFIELD — The fourth phase of Stone Haven, a new housing development in Smithfield, was completed earlier this week, en route to its sixth and final phase projected to be finished in 2016. HYDE PARK ­­— A steady stream of emergency lights lit up the eastern foothills as the sun went down in the valley Sunday night. RICHMOND — A notable appearance was made by Mayor Mike Hall, the City Council, the General Plan Committee, and a representative from J-U-B Engineers at Tuesday’s Planning and Zoning meeting. 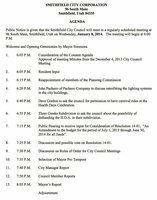 The agenda for Smithfield City Council meeting Wednesday evening includes a zoning change, sidewalk sale and phase 5 of Stone Haven PUD. 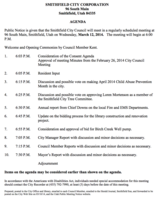 The council meets at 6 PM at city hall (96 S Main, Smithfield, Utah). RICHMOND — City Council spent time approving an array of local building-use requests at its recent meeting, with nearly a full-room turnout. It’s time again for the annual Greater Smithfield Chamber of Commerce Easter Egg hunt. Plastic eggs filled with candy and prizes are hidden throughout Mack Park (or the Rec Center if weather is bad). It’s fun for children of all ages. The hunt begins at 9 AM sharp (or 9:30 AM at the Rec Center). The egg hunt is very popular, everyone has a great time, but it’s over fast so come early and be patient. NORTH LOGAN — The City Council unanimously passed a resolution Wednesday to change a common boundary between Logan city and North Logan. The council will hold a public hearing to discuss the proposal on June 5. Submitted Story Posted March 19, 2013 4:00am Sky View Encore! Sky View High School’s Encore performance choir proudly presents “Life’s a Happy Song”. Don’t miss this evening of fun-filled song and dance for the whole family with classic hits from your favorite decades from the 1920’s up to the present day. The show runs March 21st, 22nd, 23rd, and 25th at 7 p.m. in the Sky View High School Auditorium. Tickets are available for $7 online at www.skyviewtix.org or at the door for $8. It is time to prune trees! The Smithfield City Tree Committee’s 2013 annual pruning demonstrations can give you the professional tips you need to properly care for your trees. There will be two outdoor workshops, the first specifically for pruning trees for fruit production, the second dealing with general tree health care and pruning. This is an excellent opportunity to learn techniques and have your tree questions answered by experienced professionals. Do come dressed warmly! RICHMOND — Progress and potential of the Cache Valley Transit District was the main focus of Tuesday’s City Council meeting. “We want to improve service in the face of hard economic times,” said CVTD board member Diane Bush. The roaring twenties were renowned for their jazzy music, speakeasy’s, snappy clothes, and prohibition. Thoroughly Modern Millie now being performed at Sky View has all of these and more. HYDE PARK — Come November, residents of Hyde Park will vote to see if the local Maverick, located at 675 W. Center St., will be allowed to sell beer or not. HYDE PARK — City Council members debated the possibility of approving the first green home in Cache Valley. If approved, this would be the third house in all of Utah to be a green house. NORTH LOGAN — As Mike Liechty stood in front of more than 100 parents Wednesday night in the North Park elementary school gym, faces turned from curious to furious. Liechty, deputy superintendent of the Cache County School District, delivered a 45-minute presentation outlining the district’s plan to build a new high school in Millville, a new elementary school in Lewiston and a new middle school in North Logan, as well as renovating and reorganizing many other schools.